January couldn’t be better as, a captivating love song of Afrobeats genre, titled “where she dey”, has been released today the 25th of January, 2019, by the reigning champion of the 2018 Closeup Coolbreeze Break The Barrier music competition, Afun K. Stephen known on stage as Lycon. The newly released Afro-love song is a great listening tune with easy hooks that gets you singing in no time. The song projects the versatility of Lycon, as he combines singing and rapping to the great beats of the Kaywa, CEO of Highly Spiritual Music. The released song, also comes with a music video which was by the industry gem, John Duah. Both music video and song are available on YouTube and other music portals for download. In a recent post, Lycon tweeted, ‘’I am very grateful to closeup Ghana for making me the #breakthebarrier some few months ago, with so much joy. I announce the release of my new single ‘where she dey?’ together with the video on 25th January 2019, powered by Uniliver Ghana… get your dancing shoes ready… let’s go!’’. Both the song and music video are promised components of the winning package of the Closeup Coolbreeze 2018 music competition. This is the final part of the promised winning package of the competition, as Closeup has honoured all that were promised including a cash prize, a year’s supply of Unilever products and mentoring sessions by CEO of Lynx Entertainment, Richie Mensah and CEO of Highly Spiritual Music, Kaywa. Just 5 months after winning the 2018 Closeup Campus Tour music competition, Lycon is ready to take on the world. In his words, ‘I have been working in the studio for the last 3 months and I hope I can pass on some of the things I have learnt and gathered from the highly spiritual team, most especially Kaywa whilst making my song to the rest of the world’. Lycon was discovered in Ho, as he won the number one spot in the Volta Region edition of the Closeup Coolbreeze Campus Tour, held on the Ho Technical University Campus. The finale featured 6 finalists from 6 campuses of 6 regions, at the National Theatre on the 3rd of August, 2018. After a keenly competitive 2round battle that showed live on GhOneTV, the audience and judges (Richie Mensah of Lynx Entertainment and music icon Akosua Agyepong), agreed on the talented Level 300 student from Ho Technical University, Lycon as the overall winner. The season 2 of the Closeup Campus Tour music competition, is scheduled for the 1st half of 2019 and organized by Charterhouse. 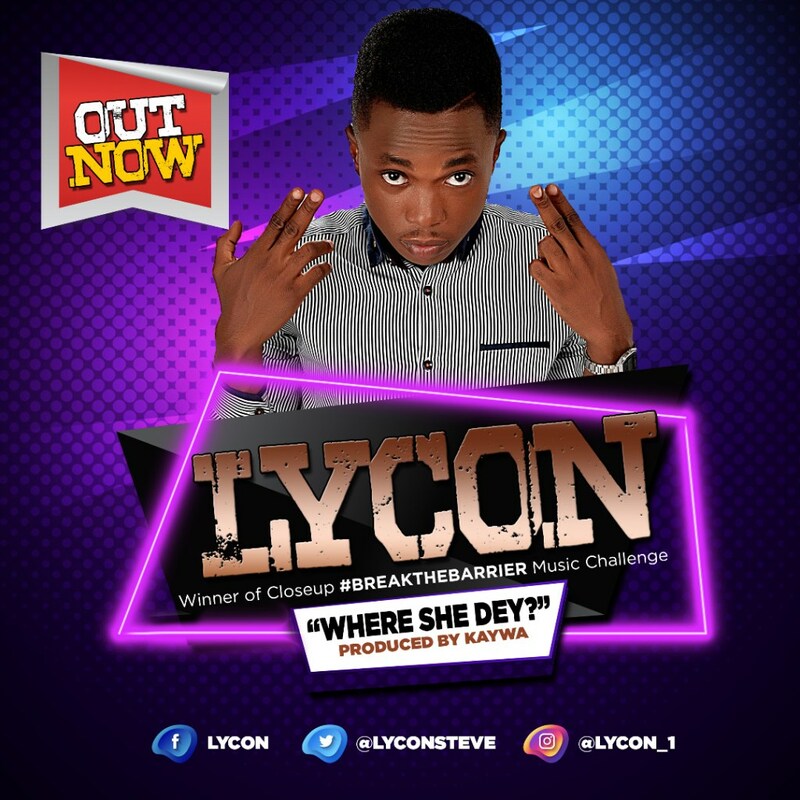 The video of his song ‘where she dey?’ premiers on his YouTube channel @Lycon Steve. The song is available for download on internet music portals.